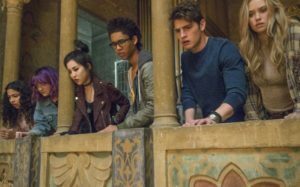 Before watching the first three episodes of Marvel’s Runaways currently streaming on Hulu, check out our interview with Lyrica Okano and Virginia Gardner. The actresses play reclusive and magically-inclined Nico Minoru and repressed daughter of a self-improvement cult Karolina Dean respectively, and they both had a lot to say about their characters and experience working on the show in this fifth interview installment. Neither actress knew about Runaways before their audition, nor were they told about the roles, but a little detective work on Okano’s part helped her figure it out before walking into the room. “The one thing is I knew she was Japanese American,” she explained. “So then all I had to research what Japanese American Marvel characters there were and then Nico popped up. I figured it out from there.” For Gardner, it was a matter of acing her audition and being privileged with the information after the fact. “After our test our director Brett Morgan followed me out of the room and he was like if I were you I would start reading the Runaways comics and look at the role of Karolina,” she admitted. Despite already knowing, Okano was also told as she left the audition – which is a pretty cool way to find out you’ve earned a role. There’s been a lot of talk about the importance of representation on television lately, but on Runaways it goes a little deeper than generic diversity. As Lyrica Okano gushed, “It was a huge deal, especially for my character’s family, the Minorus, to actually be played by Japanese American actors. That doesn’t happen.” Her parents are played by Brittany Ishibashi and James Yaegashi, two excellent actors that we look forward to seeing more of. The first three episodes of Marvel’s Runaways are available now through Hulu’s streaming service.